Tim started school bands and playing gigs from as early as 16 years old, and after many combinations, Tim became the lead guitarist for renowned New Zealand band “The Feelers”. Tim played with The Feelers during their height of fame during the “Supersystem”, “Communicate”, “Playground Battle” and “One World” albums, throughout New Zealand and abroad. During this time, Tim started jamming with old school mates - this group quickly became “OPSHOP”. The Feelers & Op Shop would often tour together, and Tim would play two sets back to back as he was in both bands. Tim played with OPSHOP for the first album “You are Here”, but took time out to raise his daughter. While focusing on family commitments, Tim began writing in his home studio. After writing 100’s of songs a little gem called “Everything’s Gonna Be Alright” popped up. With the help of old school friend and fellow band member Jason Kerrison, Tim and “The Babysitters Circus” released the song which has become one of New Zealand’s most iconic and well known singalong songs . “I am now stripping everything back and enjoying playing acoustic guitar to accompany my very talented singer friend “Ra Toia”. Initially trained in Ballet, Jazz and Tap with formal qualifications from the Royal Academy of Dance, Ra has always had a passion for the arts. Ra became heavily involved in the music scene in her early twenties. 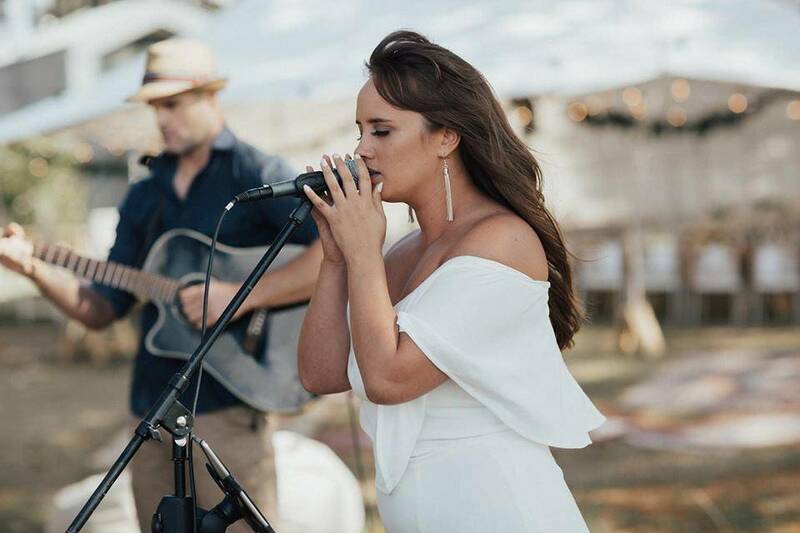 After being scouted by overseas agents, she left New Zealand at the age of 23 to perform as a professional vocalist in 5 star hotels in over 10 different Countries. Ra was a pleasure to work with, highly professional (coming from a very tough customer!) and her voice was one of those very rare voices you hear – beautiful and moving. Highly recommend Ra. Thanks Jacob. So pleased with how it all went! Ra and Hayden were AMAZING! I had spent a few weeks leading up to the wedding liaising with Ra on the various songs and accompaniments and she was happy to take all our changes and requirements on board. The day itself ran a little differently to your average wedding and they were both super flexible and happy to slot in where we needed. The guests and the couple loved them and commented frequently on how lovely they were both in sound, persona and look. I would happily book them again for another of our weddings.